Some things just don’t even sound right when you say them out loud. This case is certainly one of them. It has been making a little buzz on the local level in the tri-state area (NJ-NY-CT for our non-east coast readers) so I figured we could do our part in helping it make a little more. 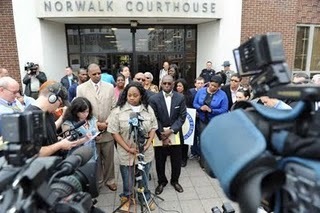 The woman standing at the microphone in the pic is Tanya McDowell. She is homeless. Not only does she have the burden of being homeless, but she also has the added burden of trying to take care of her 5-year-old son. Given the fact that she does not have an address, McDowell (who used to live in Bridgeport, Connecticut) used the address of her babysitter who lived in Norwalk, Connecticut so that her son could attend kindergarten at Brookside Elementary School. Bridgeport is 45% White, 30% Black, has a median income of $34,000/yr and 18% of its residents are living below the poverty line. Norwalk, by contrast, is 70% White, 14% Black, has a median household income of $70,000/yr and only 7% of its residents are living below the poverty line. After her son attended the school for 4 months, the Norwalk school district discovered that McDowell had falsified her address, contacted the authorities, removed McDowell’s son from the school immidiately, arrested McDowell and charged her with 1st Degree Larceny and Conspiracy to Commit Larceny in the amount of $15,686 dollars – the cost to tax payers in 2010 to educate a child at Brookside Elementary School. It is the first time in the history of the State of Connecticut that a parent has been criminally charged for falsifying a school district address. The homeless woman accused of stealing up to $15,600 from Norwalk taxpayers by sending her 5-year-old son to a city elementary school pleaded not guilty Wednesday during an arraignment in state Superior Court. McDowell’s attorneys also told Judge Bruce Hudock they would seek to have the high-profile case transferred out of Norwalk because they would not be able to find a fair and impartial jury. Crosland called for Norwalk Supervisory Assistant State’s Attorney Suzanne Vieux to dismiss the charges. To make sure we cover all bases, McDowell does have a criminal record: 10 years ago she was arrested for robbing a bank with a note, and late last year in November she was arrested for possession of marijuana and charged with intent to distribute. That being said, her criminal past has nothing to do with the current situation which, by my view, smacks of the same sense of selfishness and detachment that led Tea Partiers to taunt and harass a man with Parkinson’s Disease at a HealthCare rally last year because, according to them, he was asking for a “hand out.” At some point during our many days on the playground, we learned to share our toys with the other children. Some people never really quite caught on to that concept, the people of Norwalk, Connecticut included. This case presents an interesting question of law: whether a parent can be criminally charged with larceny for enrolling their child in a school district where they do not live (technically, yes, but pratically speaking, not exaclty a winning case for the prosecution). But, in addition to the legal issue, it presents more important moral questions about how we treat the homeless and how we value the education of a child.